The 7 Day Price Changes insight panel is a great way to keep apprised of pricing changes across your retailers. 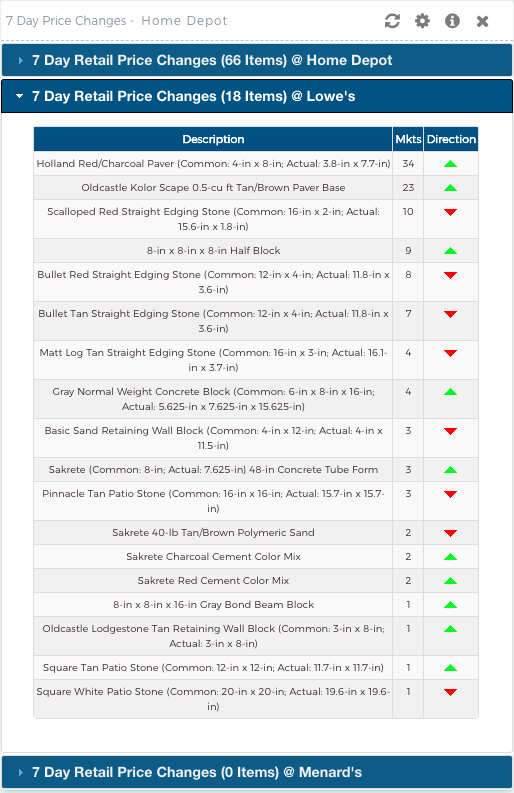 The accordion-style list can expand to show you each individual item, its weighted overall change in price with an up/down arrow, as well as the number of regions in which the price recently changed. The panel is interactive, so you can click on the number in the market column for the item and get easily to map showing each distinct change. Alternatively, you can click the item title itself to automatically run a comp shop report for this item where you can compare current pricing of your item to competing items you are currently monitoring. Fig 3 - shows an example map which can be shown by clicking on the number for the "Mkt" column for a given item.